Growing up, my Mother's chicken and noodles were one of my most favorite meals. It was not soup that she made, but a very filling meal of lots of noodles and lots of chicken. Her noodles were thinner than mine and I've never been able to duplicate her way of making them. Luckily, my husband likes larger, more substantial noodles, like his mother made, so that lets me off the hook! You mix flour, eggs, a little milk and salt in a bowl and mix until it all comes together. Pat ingredients together and work the dough into a smooth ball and place on a large, floured bread board. Flatten into a disk and turn over to flour other side. Taking a rolling pin, begin to roll out the noodle dough. It will be stiff, but just keep at it to get the dough really thin. Add extra flour if need, to keep dough from sticking. Try to roll it 1/8 in.or less. to cut noodles into hopefully uniform strips. The noodles will get larger when cooking, so keep that in mind when cutting. Mine were actually a bit larger than I enjoy, but my hubby liked them! I also cooked a chicken so I had homemade broth to use. In a large pot I stewed a 4 pound chicken in 10 cups of water for about 1 &1/2 hours. If you are short on time, you can use canned broth and buy a roasted chicken from the deli. Mmmmm, there's nothing like a bowl of this on a cold evening! To make noodles, combine in a bowl, 2 cups of flour and 1/2 tsp. salt. Break 2 eggs in a dish and add 4 tablespoons of milk and beat well. Add to the flour mixture and stir well; dough will be very stiff, but it will come together. If needed, you can add more milk, 1 tsp. at a time. On a large floured surface, roll out the noodle dough very thinly, about 1/8 inch or less. Use more flour as needed to keep the dough from sticking. Now it can dry for 1 hour. Taking a pizza cutter or a knife, cut dough into desired lenghts. If possible, let noodles dry at least 1 more hour, or until chicken is done cooking. In a large soup pot put one chicken (about 3 1/2-4 pounds) in 10 cups of water and bring to boil. Turn heat down and cover pot, and simmer for 1 1/2 hours, or so. Remove chicken to a platter to cool. This can be done 1 day ahead, if desired, then there is time to chill the broth and spoon off all of the fat that accumulates. But, if you are doing this in one day, you will need to carefully skim the fat off of the hot broth. If, using canned broth, skip the previous instructions. Into hot broth add 1/2 of a large onion, diced, 2 or 3 stalks if diced celery and 2 large carrots, sliced. I always add potatoes too, as did my Mother and Grandmother. They said it was the German way, so who am I to argue! Peel and cube 2 large potatoes and add to broth. Cook for about 10 minutes. You are now ready to add the noodles, a few at a time so that they don't stick together. I cook them about 20 minutes until tender. Add 1 teaspoon salt, or salt to taste. I am a low salt cook, so this may not be enough salt for you. You may also use 1 tablespoon chopped fresh parsley, if desired. I also use pepper and sometimes Tarragon. At this time, add in about 3 cups of cooked chicken, but don't bring it to a boil as it will cause the chicken to fall apart and become stringy. If the chicken and noodles are too thick you may add in more broth or even water and adjust the seasonings. This is one comforting meal and it has always been a hit in my family. All of my children love it and I consider that a miracle! It was difficult when my 3 kids were young to find something that they all loved to eat. But this is it! Do you make homemade noodles? I love making homemade noodles - my kids really like them. Your soup looks great. This looks great. I haven't tried to make my own homemade noodles, but I'd bet it would be a great activity to do with your kids. They might not come out as pretty, but I know my nephew would really get a kick out of it. I've never tried homemade noodles, but someday I will. Your soup looks fabulous. 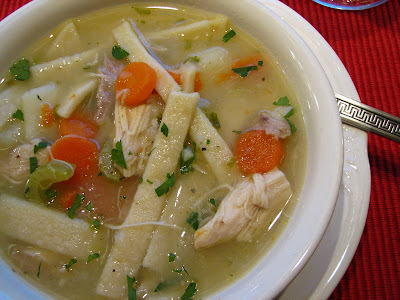 I love chicken soup, all year round, cold or hot weather.